The Lucas Gusher at Spindletop Gladys City Boomtown Museum may not be your usual roadside attraction, but it&apos;s definitely worth a stop. 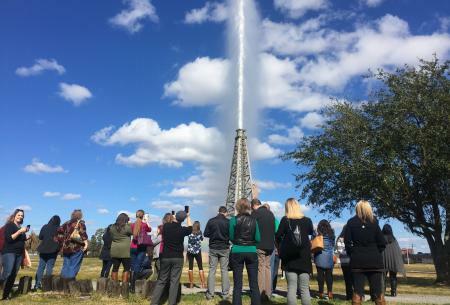 A working replica gusher, it sits right off Highway 69 in Beaumont, Texas and blows water hundreds of feet into the sky at the same rate oil blew in on that famous day in January of 1901. At approximately 10:30 a.m. on January 10, 1901, while the Hamill brothers were attempting to free their drill from a crevice, the famous Lucas Gusher blew in. Oil sprayed over 100 feet above the derrick for nine days until the well was capped. Named after Capt. Anthony F. Lucas, an Australian born mining engineer and financier of the Spindletop drilling, the Lucas Gusher was the greatest oil well ever seen. Although Lucas estimated its flow at 6,000 barrels per day, it was actually flowing 80,000 to 100,000 barrels per day. Practically overnight, thousands of sightseers, speculators, promoters, fortune seekers, and "boomers" poured into Beaumont as news of the discovery spread. By 1902, 285 active wells were operating on Spindletop Hill. Over 600 oil companies had been chartered. Although most vanished overnight, some such as the Texas Company (Texaco), J.M. Guffey Petroleum Company (Gulf), Magnolia Petroleum Company (Mobil) and Sun Oil Company went on to become giants of the industry. Before visiting, we recommend checking the Gladys City website for a current schedule of the gusher re-enactment and other special activities. Dedicated on January 10, 1976, the 75th Anniversary of the Lucas Gusher, Gladys City was given to the State of Texas and Lamar University for continued care and development as an education resource. The buildings in Gladys City are all patterned after buildings that were at Spindletop in the early 1900s oil boom. Many of the artifacts used to furnish the exhibits are from the time of the boom. In the years since its dedication in 1976, over one-half million people have visited Gladys City. The museum provides many services to the public, including school tours, adult group tours, teachers&apos; workshops, and historical information for researchers, journalists, and the general public. The museum holds an annual anniversary celebration complete with re-enactors each year in January. Visit Gladys City and the Lucas Gusher.